If you've followed along this week here and here, you may be happy to see that I've (tentatively) arrived at a new logo design - I think. This has the word actually drawn out as so many suggested and it also means that I'll stop bothering you with my wobbly decision-making processes. So, here 'tis, the (tentatively) final product. At least for now. Of course, now I'm thinking that I should also sketch "waterstone". Sheesh. I'm still trying to dig into, around, and out of my dilapidated studio. Pray for me. How about you? Weekend plans? "I Heart Macro" slash "I Heart Close Ups: Up Close Photography for Macro Makers and the Camerologically Challenged"
Love the logo! I don't think you should draw out "waterstone" as it would then make the logo too busy. 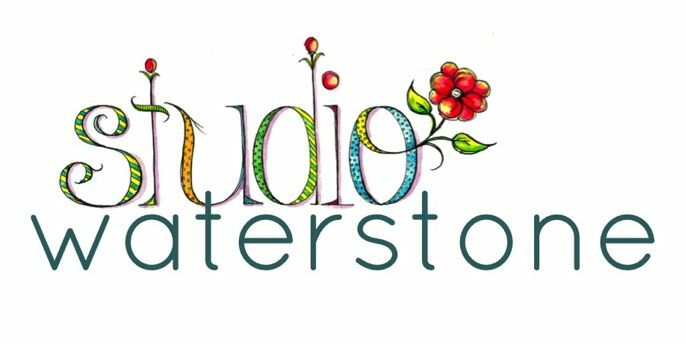 Drawing the word "studio" emphasizes your creativity and keeping "waterstone" as plain text gives the logo a polished look. That is just my opinion anyway. This weekend I am locking myself in my studio until everything is unpacked and put in a proper place! Breaks for coffee and chocolate are permitted. Kathleen, that's my initial thought on keeping "waterstone" simple. Thanks for the reinforcement. I agree, this is the one. Fun yet professional. Finish watching Benjamin Button (I'm probably last person to view this film). Sketch design for new wool rug. Work on reupholstery for client. Oh and squeeze in something special to celebrate wedding anniversary. Really lovely. I have always wanted to try water color. How about a post on the basics? LOVE this one! It's fun without being too cutesy, which I think it would be if you sketched waterstone. As for the weekend, I think my knee is ready to wander up and down the aisles of an antique mall. Or at least 2 or 3 aisles! I absolutely love your new logo...it's beautiful! This one is perfect! Kathleen said it best! I really like it....i am on the couch for the rest of the day...i made brunch for my bi-monthky family get-together (15 of us) and I am now exhausted! Enjoy the rest of your weekend! I like it as is! I think that drawing out waterstone, too, would make it a little busy. That just makes me smile big Miss Lori! It is so uniquely you! And the waterstone not sketched is great too. Delighted to see how this all evolved for you. I wish that I had a talent like that for sketching and watercolor. I would follow your lead and make myself a logo! Love your new logo design. Wow! I guess the little humble opinion I was about to leave makes that unanimous! I love it-don't change a thing! Sketching out both words would take away from the design-too much!